Some of you may have noticed the little countdown widget on my site, that says “Honolulu Bound” and the date is for February of 2015. Well, that little countdown widget was a lot of fun for the weeks and then days leading up to departure, and it has become a unique little keepsake of some great memories. Spending 10 days in Honolulu, Hawaii was the opportunity of a lifetime to spend time with other Uke enthusiasts, learn from Hawaiian musicians, do some sight-seeing, ride the Waikiki Trolley, do some A-B-C shopping and stroll the famous Waikiki Beach. 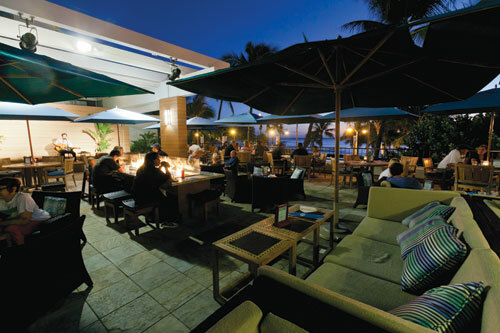 Heck, we even ate at the world-famous Duke’s on Kuhio Beach – literally! Our table was in the sand, ON the beach, and guess what? there was a sunset, too!!! One thing we enjoyed each day was making our way over to the Moana Terrace on Kalakaua, located at the Waikiki Beach Marriott Resort, directly across from the beach, offering guests plenty of unimpeded sunset views over Waikiki. Every night they had local Hawaiian entertainment of some kind. Sometimes it was a singer with back-up band, sometimes a duet, and sometimes a family band, and each member contributed a talent to the songs. We sometimes ate right there in the padded lounge chairs, sometimes we just ordered an after-dinner tea or coffee. But every night, right about dusk, buskers would appear on Kalakaua street and play their instruments. I was especially interested in those playing Ukulele’s. It took me a while to get it downloaded to Youtube, but here is the video I took of two Hawaiians playing Lovely Hula Hands. About half-way through you might notice a lady donating money to them. That was my travel companion, Barb. Here is my arrangement of the song for those of you who missed the posting: Lovely Hula Hands. 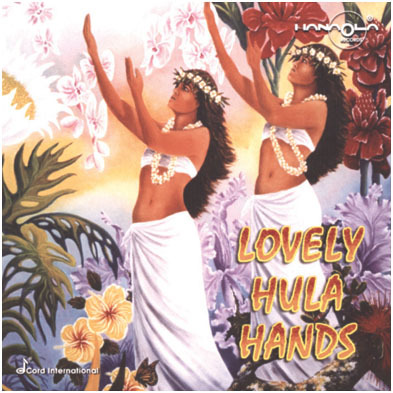 A good choice for a solo performance when you are out with your ukulele group as the entertainment for a Hawaiian luau is Lovely Hula Hands, by R. Alex Anderson, 1940. This is a great “hapa haole” composition featuring wonderful prominent Hawaiian imagery and the Hawaiian translation for the title, “kou lima nani e”. Currently, these are my choices for solo-ing, and even better if you can get the wildest dressed guy in the group to dance a little hula for you: Pineapple Princess, Ukulele Lady (as a duet), Beautiful Kaua’i and Lovely Hula Hands. Of course, we can’t always have Betty Boop doing a hula for our solo’s. Wouldn’t that be great? Luau’s are my favorite. I get to dress up in a flowered dress or skirt, or my muu muu, put a flower lei around my neck and flowers in my hair. That being said, my experiences entertaining at luaus here in Canada have been quite limited. I’ve participated with a group at 6 of them, and they were so much fun, and at one they even provided the food for us! Through researching Hawaiian music, it is really interesting to take note of the difference between Canada and the US in regards to being Hawaiian, and of growing as a nation with the creation of Hawaiian music being part of your actual (US) history. For the past month I have been searching the internet and downloading as much Hawaiian tunes arranged for ukulele as I can find, and the majority of them seem to be in the Hawaiian language. Even more surprising was how limited my knowledge of Hawaiian songs is. Pearly Shells and Tiny Bubbles. Oh, and Hawaii by the Beach Boys. 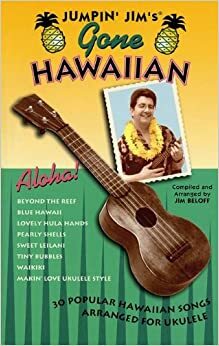 The ukulele songbook, Jumpin’ Jim Goes Hawaiian, was invaluable, and also, illuminating! Many good songs in this one, including an original composed by Jim Beloff entitled I’m Carrying a Tiki Torch for You. I wish I knew how it goes because the lyrics are great! When I was in Honolulu in March last year, the street performers come out at dusk and play songs on the prominade all night. There’s a short wall that is the perfect height for sitting on that goes along the edge of the sidewalk on the street by the beach in Waikiki – Kalakaua – plus trees and bushes. This is usually where they congregate, one or two per block all up and down Kalakaua avenue. Barb and I had taken a liking to an eatery up above street level called the Moana Terrace where they had some form of live entertainment every single night. Sometimes it was a one-man band, other times it was a duo or a family group playing the old authentic Hawaiian tunes in the language and having a nice time and good time. One of these such bands actually took requests from the audience. So one night, right at sunset over Waikiki Beach, Barb and I happened upon a Hawaiian musician sitting on this wall on the sidewalk, playing his electric ukulele, accompanied by a guy on a drum. And they were just a rockin’ this Hawaiian song called Lovely Hula Hands. I had never heard it before so I got my phone out and recorded the performers. If I can ever figure out how to upload it from my smart phone I will for sure post it on my site. For now, we’ll just have to enjoy my arrangement: Lovely Hula Hands.